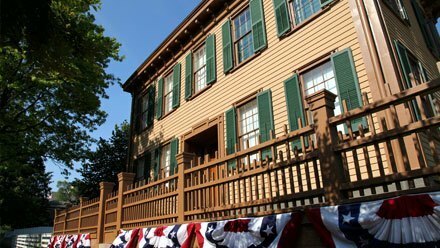 Above: Abraham Lincoln's home in Springfield, Illinois. 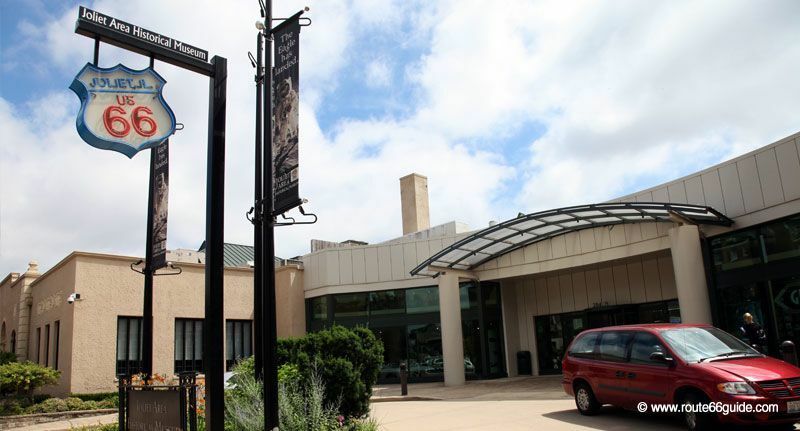 In each of the eight states traversed by Route 66, one finds small - and seldom large - museums run by the regional Route 66 associations or by the parks department of the State concerned. Some states have several (two in Illinois, Missouri and Oklahoma). These institutions, standing right on the Route they evoke, are usually free and shed light on interesting regional economic and human implications of this legendary road, but also on the devastating consequences of its decommissioning in the bordering communities. Above: Route 66 Museum in Clinton, Oklahoma. Their interest and scenography vary greatly. There is a jumble of photos, historical newspaper articles, objects relating to motels, restaurants and other businesses along the old Route (keys, old menus, drive-in theater accessories, antique cars, neon signs, etc.). 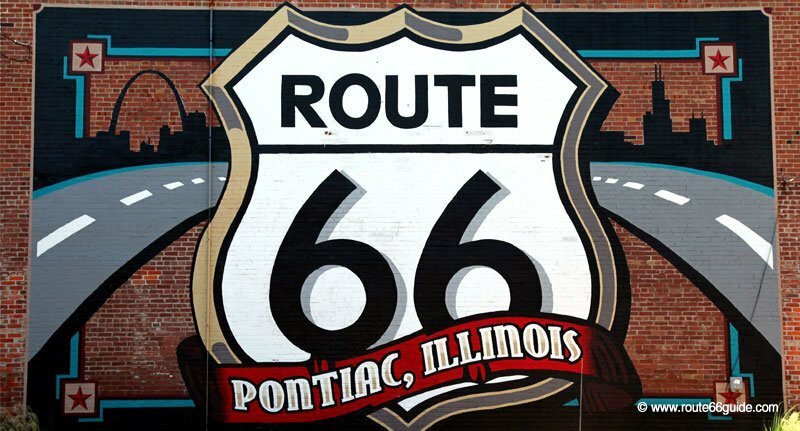 The Museum Association of Route 66 in Illinois welcomes visitors leaving Chicago, in the gradually deserted city of Jolliet. Here, you can feel the first effects of Route 66's decommissioning: a quiet, too quiet main street. Deserted sidewalks. Shops closed. Emblematic stillness. At the entrance of town, the Museum "Route 66 Experience at Visitor Center" is devoted largely to the icons of Route 66 in Illinois; motels, restaurants/diners, gas stations, many of which appear magnificently restored, which is not surprising because the Illinois Route 66 Association is one of the most active and deserves our heartfelt appreciation. Above: Joliet Area Historical Museum, Illinois. Close-up on the brand name "Dairy Queen", the queen of ice cream, which has now diversified into more traditional fast food; a huge US chain which is however little known across the Atlantic. At the entrance of the museum, a giant Route 66 map traces its route through eight states; it is staggering too realize we still have 4,000 kilometers ahead of us! 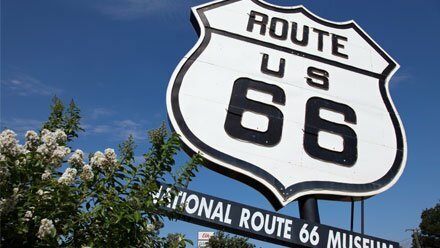 As the second museum dedicated to Route 66 in Illinois, it is devoted not only to its home state but also portrays a variety of personalities that shaped the history of the transcontinental route along its entire path from Chicago to Los Angeles. Above: The "Route 66 Hall of Fame" of Pontiac, Illinois seen from the outside. In the city of Murals (about twenty of them on Pontiac buildings), the museum is no exception to the rule and features a huge mural honoring the Mother Road. Being inducted into Route 66's "Hall of Fame" is a honor and represents a recognized distinction even today. 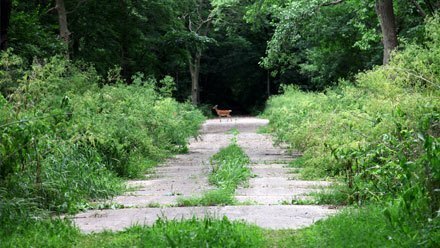 Managed by the state parks department of Missouri, this small museum devotes a large part of its permanent exhibition to the community of Times Beach, which stood here before being abandoned due to a major dioxin contamination. 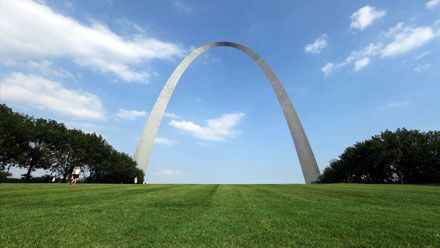 Moreover, it presents some mythical institutions that have marked the history of Route 66 and a few sights not to be missed along Route 66 in Missouri. 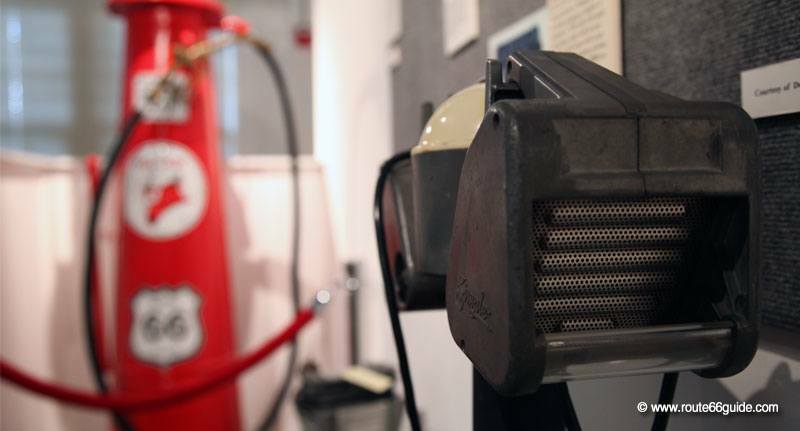 Above: In one of the exhibition halls of the Route 66 Museum in Eureka, Missouri, you can manipulate the portable speakers that motorists clung to their windows in drive-in theatres. 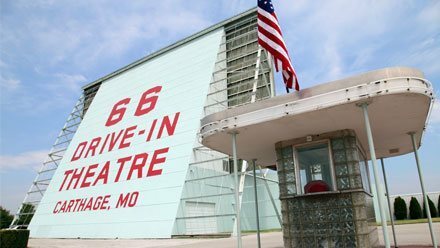 Missouri has a superbly restored drive-in theatre in Carthage. 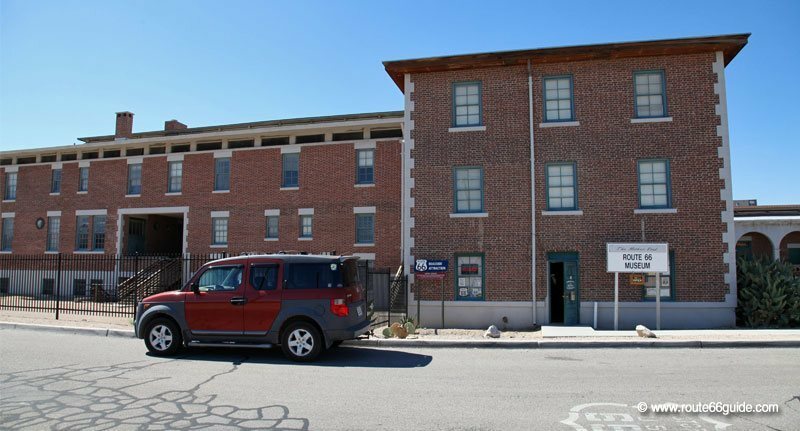 The museum is located in an old roadhouse dating back to 1935, the old "Bridgehead Inn" that welcomed Route 66 travelers. Located in the same building as the Public Library of the small town of Lebanon, the pleasant "Route 66 Museum" displays various reconstructions of emblematic decorations seen in the heyday of Route 66 (1950-1970). Thus, we walk into an old motel room as set in 1946 at the legendary "Munger Moss Motel", Route 66's landmark hotel also located in Lebanon. 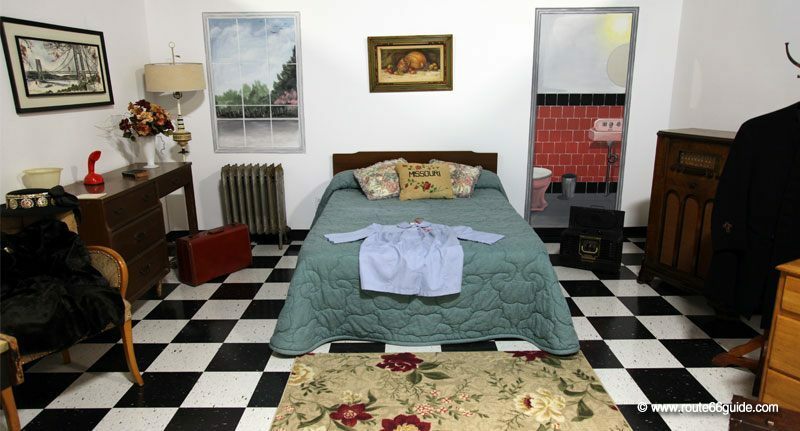 Above: Reconstruction of a motel room of the years 1940-1950 at the "Route 66 Museum" of Lebanon, Missouri. Most items are original. Further, a restaurant -diner of the 1950's, with its formica benches arranged around a chromed counter and a gleaming jukebox. Then, a soda fountain and a multitude of photos, press clippings, items related to the Mother Road in the State of Missouri. Many close-ups of the flagship institutions of Lebanon and its surroundings, of which few have regrettably been preserved. In Kansas, only three - very small - localities are crossed by Route 66. 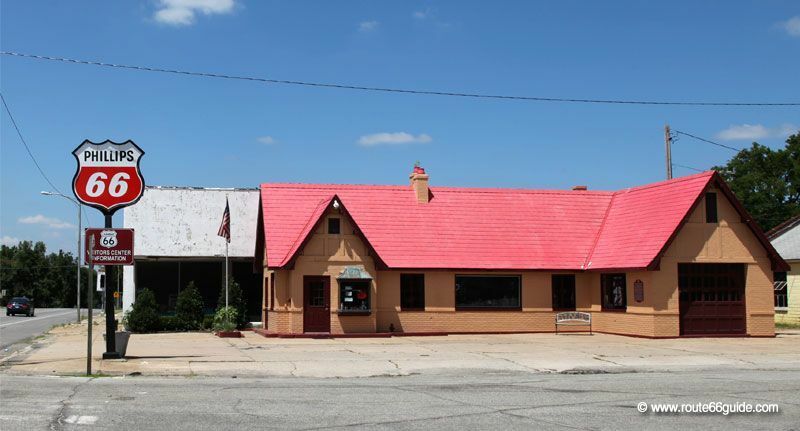 Nevertheless, the local Route 66 Association is very active and runs this small museum in the center of Baxter Springs, right by a real Philips 66 station of the 1930s. It provides various informations on Route 66 attractions in Kansas. Above: The "Route 66 Visitor Center" of Kansas is housed in a beautiful "Philips 66" service station. It chalet-cottage style was widespread along the transcontinental route. 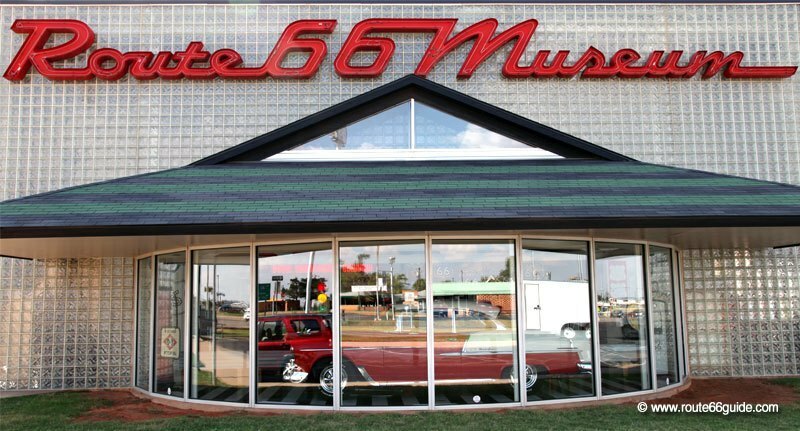 The Route 66 Association in Oklahoma runs this original museum, created thanks to donations and financing of the local population of Chandler. Resolutely modern, the Interpretive Center runs several documentaries, interviews, and archival footage that we enjoy sitting back in the upholstered seats of an old car or lying on a motel bed replica (not a top mattress to be honest... ). 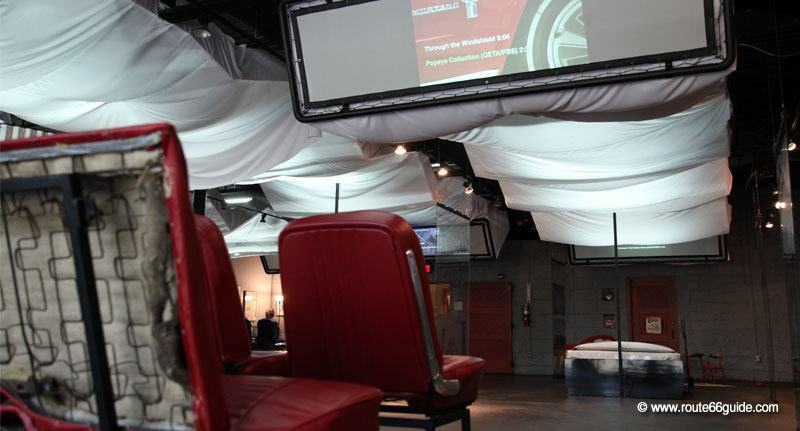 Above: At the Route 66 Interpretive Center in Chandler, Oklahoma, comfortably installed on car seats or lying on a motel bed, we enjoyed several Route 66 video clips. The unanimous opinion is that this is the best museum along Route 66. Indeed, we really enjoyed our walk through the showrooms, moving forward in time through a series of thematic reconstructions (garage, restaurant dinner etc.) to the sound of the musical standards, activated by the visitor on entering each showroom. 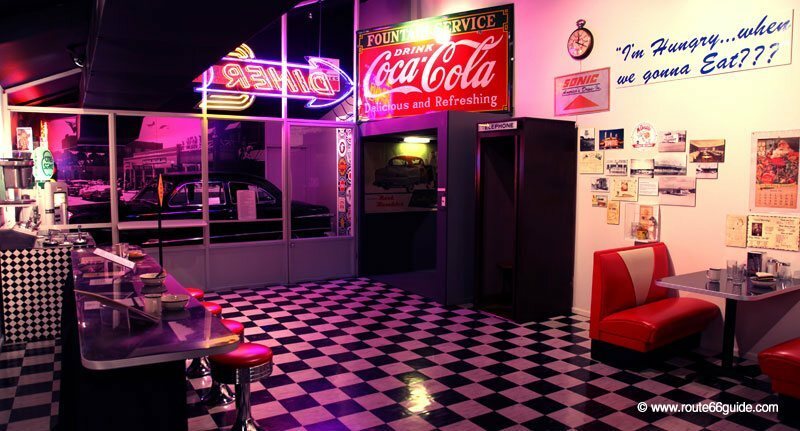 Above: Route 66 Museum in Clinton, Oklahoma, reconstruction of a typical family dinner of the 1950s with its checkered black and white floor, chrome bar, colorful banquettes and jukebox. Unlike most other museums on Route 66, the one in Clinton provides a broader picture, covering all eight states on its path. 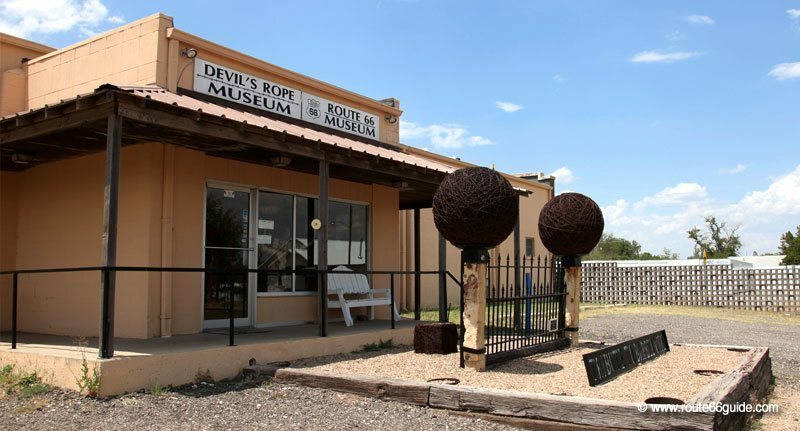 The Museum of the Route 66 Association in Texas is located in the same premises as the Devil's Rope Museum, the museum of barbed wire whose importance in the expansion of cattle ranching in Texas can hardly be underestimated. Above: Route 66 Museum (Devil's Rope Museum) in McLean, Texas. 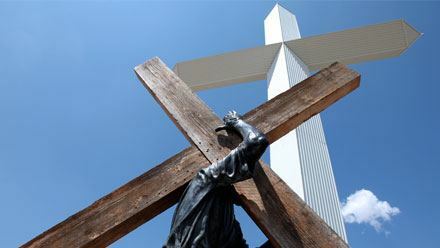 In the mountains of Barstow, California, a small museum of the Mother Road hosted by the Route 66 Association in California presents major attractions and mythical establishments along the transcontinental route in the state. Several artifacts, including old cars, an old gas pump, and a police motorcycle. Photos, newspaper clippings, billboards, souvenir shop, etc. Above: Route 66 Mother Road Museum in Barstow, California. Above: National Route 66 museum. Elk City, Oklahoma. 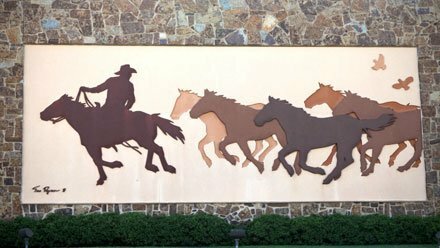 Each state crossed by the 66 has its own museum of the historic Route, usually hosted and funded by the regional Route associations. 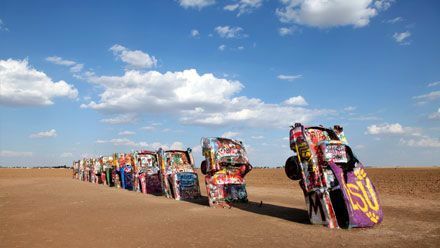 In addition to these official museums, providing ample information on Route 66 attractions in the area, there are a number of other small museums dedicated to an amazing diversity of - rather wacky at times - themes. 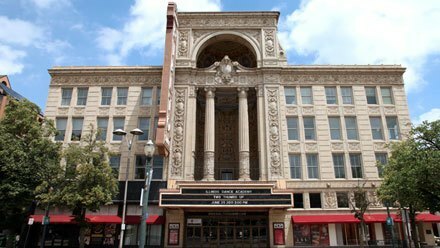 Above: Arcadia Arcade Museum. Mac Lean, Illinois. 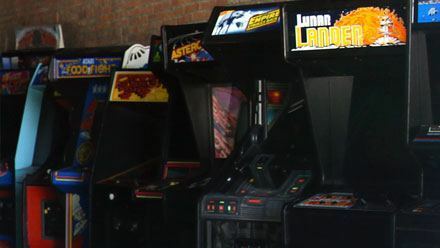 In this small museum, you can play the most popular arcade games of the 1980s ... at 80's rates! Managed by a passionate fan, its opening hours are limited. From collections of neon road signs to exhibitions devoted to cowboys (Oklahoma City, Oklahoma) to arcade games of the 1980s (Mac Lean, Illinois) and firearms (J.M. Davis Gun Museum. Claremore, Oklahoma) or barbed wire (McLean, Texas), there is a bit of everything and anything in the small - and largest - museums along Route 66. Some notable, other unusual, but all - or almost all of them - run by real enthusiasts. And this is where their true interest lies. Above: National Cowboy & Western Heritage Museum. Oklahoma City, Oklahoma. In the opinion of a world rodeo champion (nothing less! ), this museum is a must-see. It presents the biggest names in the sport but also the most famous cowboy movies. One can also visit the reconstruction of a city from the early nineteenth century. 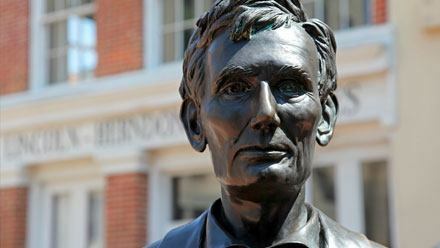 Springfield, Illinois is the birthplace of Abraham Lincoln, President of the abolition of slavery in the United States after a hard-fought and painful civil war. It is here that lawyer "Abe" - as he is affectionately called by locals - had his law office, a few steps from the capitol that saw him regularly litigate. Above: Statue of Abraham Lincoln between the old Capitol of Springfield and its law office, Illinois. 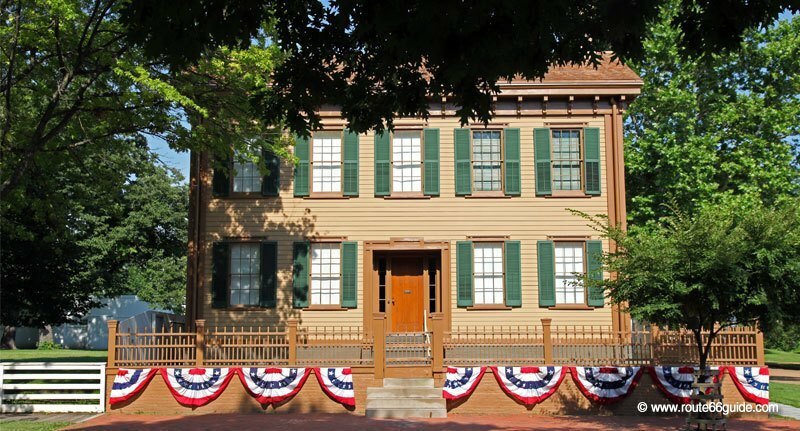 Abraham Lincoln's law office and home are open to the public. We especially enjoyed wandering through the rooms - rather basic although decorated with delirious wallpapers - of his home, the last before his move to the White House and his assassination. We follow the insightful and humorous comments of the U.S. national parks ranger, who seems to have a true devotion for the man ...and whose - remarkable - double you can spot strolling through the gardens at the end of your visit. A newer complex, including a museum and a Presidential library, allow us to familiarize ourselves with this truly outstanding character (by his height too! ), autodidact, deeply human, and endowed with a rare intelligence. It remains one of the most popular presidents in the history of the United States. In Claremore, Oklahoma, the J.M. 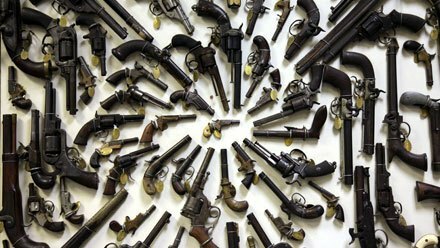 Davis Gun Museum has the largest private collection of weapons in the world. Indeed, there are thousands of them! This part of the exhibition can be interesting as you traverse ages and continents. We discover, for example, the first gun in history, a Chinese model dating from 1350, as well as weapons of notorious outlaws, such as Bonnie Parker and Clyde Barrow, Jessie James, Pancho Villa, or some of the Dalton brothers. Above: J.M. Davis Gun Museum. Claremore, Oklahoma. Private collection of J.M. Davis. Much more disturbing are the exhibitors showing the hanging ropes of some famous criminals of Oklahoma and the United States, but also the hoods covering their heads and detailed pictures. Forewarn your party!